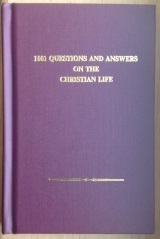 On our original post, we had a request for more from 1001 Questions & Answers On The Christian Life. So I’ve shared a few additional excerpts below. I’ve also posted a random winner of the book at the end. If you didn’t win, you can find 1001 Questions in some Amish stores which carry books. You can also order it over the internet through this site, which sells Pathway Publishers books online (the book is about halfway down the page and costs $1.50). Below, a few more excerpts from the book, taken from the following sections: “The Church”, “Confession”, “The Christian Woman’s Devotional Covering”, and “Our Way of Life”. As before, I have omitted some questions. Lance suggests complementing this one with two other books, In Meiner Jugend, and A Devoted Christian’s Prayer Book. His comment describing these two in more detail can be found in full here. Where does the word “church” come from? It is a Biblical term, and is found in the New Testament over a hundred times. Is it not sometimes used to mean a building? In the Bible it is never used in that sense; church always refers to people, not to a building. Three times we can read where the church (meaning the people) assembled in someone’s house: (Rom. 16:5, I Cor. 16:19, and Philemon 1:2). Of how much importance is the church in the life of the Christian believer? It would be just as reasonable to ask how important a little child’s mother is. Why bring in mother here? Because just as God is our spiritual Father, so the church is our spiritual Mother (Gal. 4:26). What does the church do for us? Much the same things in a spiritual sense that a mother does for her child in the natural – providing love, teaching, food, clothing, care when we are sick, example, prayer, and discipline. The church also provides a means of Christian fellowship among believers. “If we walk in the light, as he is in the light, we have fellowship one with another…” (I John 1:7). Does the church have the right to make rules and regulations for its members? Not only a right but a sacred responsibility to do so. What is the Biblical support for this? Read Acts 15. It describes how the Apostles came together to decide on certain issues of their historical time period. Since we live in a changing world, new issues will arise which are not specifically mentioned in the Scriptures, and we will need to apply Scriptural principles in deciding what is best for the church. What importance does the Bible attach to true confession? “If thou shalt confess with thy mouth the Lord Jesus, and shalt believe in thine heart that God hath raised him from the dead, thou shalt be saved” (Rom. 10:9). Of what is a confession of Christ an evidence? “Whosoever shall confess that Jesus is the Son of God, God dwelleth in him, and he in God” (I John 4:15). What is our duty regarding our faults? “Confess your faults one to another, and pray for one another” (James 5:16). Shall all sins be confessed? All public transgressions, or the knowledge of which is liable to become public, should be confessed before the public. Since there is restitution in confession it should go at least as far as the offense. When private sins are fully repented of and confessed before God, judgement and circumstances should determine as to how much further the confession should extend. How far should the Church bear with offending members who stubbornly refuse to confess their sins? That depends upon the gravity of the offense or offenses, the nature of the individual, surrounding circumstances, etc. Always give the offender the benefit of the doubt where doubt exists, but never condone sin where it is positively known to exist. The following scriptures throw some light on the subject: (Matt 18:17; Luke 13:6-10; and Gal. 6:1). What confessions should every child of God be ready to make? “Be ready always to give an answer to every man that asketh you a reason of the hope that is in you with meekenss and fear” (I Pet. 3:15). Does not Paul say that woman’s hair “is given her for a covering”? Yes, but not the covering which he was talking about before he brought in that illustration from nature to impress the force of his teachings. What is the difference between the two coverings? The long hair is the sign of the natural relation which exists between man and woman according to nature; the veiling is the sign of the spiritual relation which should exist between them as man and woman in the Lord. Why is the illustration from nature a good one? Because women of various cultures throughout history have gloried in having long hair. So let all Christian women be fully as loyal to God by wearing the sign of her spiritual relation to man – the covering. What does the apostle Paul conclude? Wear both or none (v.6). To discard the covering required of God is the same as if she had her hair shorn or shaven. What if a woman feels self-conscious wearing a covering because people stare at her? It is right to obey God and let our lights shine. If this causes the world to gawk and gaze, the matter rests with them, not with us. Should the covering be worn when women are ashamed of it? Timid sisters sometimes feel abashed because of the scorn and rudeness of a proud and foolish world. They need to pray more for grace. Worldly-minded sisters are reluctant to wear it because of the condition of their hearts is not in keeping with the purpose for which this “sign” is worn. They should pray for conversion. Neither should discard the covering. How does our Christian faith shape and influence our way of life? In many ways. For instance, the desire to live in a rural setting. What is wrong with living in a city? When Cain fled from the Lord (Genesis 4), one of the first things he did was to build a city which he peopled with his wicked descendants, filled with the smoke of industry (v. 22), and lulled with music and arts (v. 21). Cities have been degenerating ever since that time. We find in them every evil and vice known to man. Are there not also evil men in the country? Yes, for the marks of sin are found on men everywhere. But cities and towns bring them close together where they corrupt, support, and harden each other. Even among wild or domesticated animals, we find that overcrowding produces vicious and undesirable behavior. Are there no Christians in the cities? There surely are. But the point here is not what is possible but what is desirable. We see a great danger in placing ourselves in such a setting. “All things are lawful for me, but all things are not expedient” (I Cor. 10:23). What are some of the advantages of rural life? Aside from what has already been mentioned, we find in the country a much closer communion with God. Life in the country is awake to the natural order of daylight and dark, sunshine and rain, the swing of the seasons, and the blessings with which God has ordered our world. It is a life which allows us to not only witness daily, but also be a part of, the natural world of God’s creation. Compare this with the largely artificial environment of urban centers where night is well-lit, rain is the way to ruin a day, and food and fiber originate at the local store. What about the radio and TV? They are to be classed with other forms of worldly entertainment. Both the music and the programs portray a way of life and a set of values not fitting for the Christian. How many minds have been damaged and polluted by the diet of romance and violence from these media? Forsaking these is one of the first and most important steps for anyone seeking a fuller and more committed Christian life. Is it not our duty to keep up with the news? We can keep well enough informed about local and world events for humanitarian and relief purposes through our religious and community papers. Our book winner, selected using random.org, is comment #28, KimH. Email a mailing address to me at ewesner@gmail.com and we’ll get the book to you. Special thanks to ShipshewanaIndiana for providing the copy for this contest. Thanks for sharing more excerpts from the book. It helps us further understand Amish life from an Amish source. Thanks also for sharing the link to ordering Pathway books. I had no idea their listing of books and other publications was available online, but I see that it is an independent distributor of Pathway books and not a site maintained by Pathway itself. You have a good point that the thrust of Acts 15 is toward freedom. But this is freedom from the Law of Moses. This raises a whole array of exegetical and hermeneutical questions that cannot be addressed briefly. I only want to make the observation that moving from ‘freedom from the Law of Moses’ to individual freedoms as enshrined in the Declaration of Independence is to change subjects, or at least is a considerable leap. The katakalupto Paul enjoined women to wear was not informed by Islamic practice because Muhammed wasn’t born until the end of the sixth century. A perusal of Greek literature reveals that this word always refers to the head but not the face. And men may wear a hat but not during prayer because two concepts are involved, the symbolism of the act (affirming the male-female headship order) and the matter of modesty. There is some complexity to this issue so perhaps you will still object but maybe another time, another place. A little problem with saying ‘this certainly included clothing’ is that there are commands to have modest clothing in the New Testament: “1Ti 2:9 ¶ In like manner also, that women adorn themselves in modest apparel, with shamefacedness and sobriety; not with broided hair, or gold, or pearls, or costly array;”. The idea that ‘no greater burden’ means that there are no commands of behavior to be obeyed by the NT believer is to cause one to edit out much of Paul’s writings from the Bible. That cannot be. 1Co 14:33 “For God is not [the author] of confusion, but of peace, as in all churches of the saints.” If there is confusion and strife, it is of man and satan, not from God. Since God wrote that verse about modest apparel, you can be absolutely sure He wants all believing women to be adorned in modest apparel all of the time. A believing woman sees that, an unbeliever strives against it. Godly faith is seen in obedience to God’s commands. John 14:15-24. Eph 2:8-10 tells us that our works don’t save us, but that we are saved to do good works. Please consider this as a tongue in cheek response to the warning against cities. Isn’t Heaven described as the new Jerusalem (a well-known beloved city of Israel), and aren’t we supposed to compare our faith as to a city set upon a hill for all to see? I was born in a rural setting and am so glad God created cities with plenty of concrete and asphalt to roll my wheelchair upon. This Christmas season I took a trip to meet some of the Amish Newspaper scribes in (mainly) Kentucky. In Scottsville, Kentucky the scribe actually made me a little breakfast, since I arrived there way early in the mornings with donuts. They also gave me one of these “1001 Questions…” book with a note inscribed. Nice people to meet. A side note is that they had 4 turkeys that would follow you around from the car to the house. If you were with the scribe they were OK, but if alone they would get close and swat you with their feathers….just to let you know who was in charge. LOL Great fun! Thanks so much to random.org, Eric, Amish America & ShipshewanaIndiana! New Year Blessings to All! What do Amish think about atheists?